Ramsey AS members enjoyed a great end to the coarse fishing season on fen drains. In the midweek match on the St Mary’s section of the Old Nene it was Ray Myring in first place with 13lb 6oz of roach taken on a waggler. Runner-up was Vern Edgley, who caught a net of perch taken on chopped worm and red maggot for 12lb 13oz, then came Keith Rayment with 9lb 7oz. Sunday’s match on Ramsey Narrows saw some even better weights taken. Top rod with a very impressive 51lb 13½oz was Andrew Kilby. He caught a huge net of rudd on the pole with worm and red maggot. Paul Kilby took six tench on worm to claim second place followed by Ray Myring with 16lb 6oz. 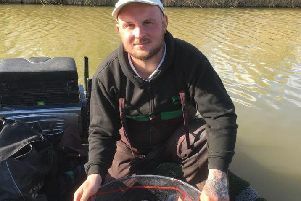 The Steel City Open on the Overton Lake at Ferry Meadows on Sunday was won by match organiser Mick Smith with a 68lb 11oz net of bream taken on long range feeder tactics. Michael Buckwalder came second with 56lb 9oz, then came Carl Hammond with 36lb 8oz.